On Saturday, April 22nd the United Liberty Coalition held their 1st Annual Unity Rally on the Senate lawn of the Arizona Capital complex. 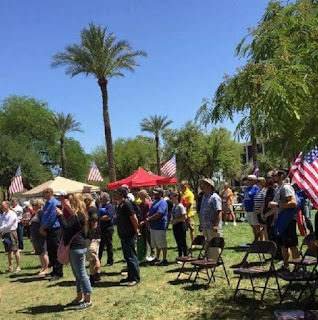 The rally which drew about 200 attendees according to CBS 5 featured speakers including AZ State Senator Steve Smith (R), AZ State Representative Vince Leach , US Senatorial candidate Dr. Kelli Ward and Lanterns.buzz's host of The HollowNet: Matthew Holloway. Despite the 95 degree weather spirits were high at the capital as the speakers and activists called for unity in principles and support for the presidency in light of divisive and even violent rallies elsewhere in recent weeks. Security was ever present and though courteous and professional were a reminder of the dangers posed by political expression in America today. It was a message that resonated through many voices, brought together by common purpose. You can find Matt Holloway's speech at the rally on Facebook here. its a great start, peaceful and positive!